Check out the following link for clarifications. Electricity travels at the speed of light more than 186,000 miles per second! If you had a light bulb on the moon connected to a switch in your bedroom, it would take only 1.26 seconds for that bulb to light up, 238,857 miles away. If you traveled as fast as electricity, (about 300,000 kilometers = 186,411.358 miles per second the speed of light), you could go around the world 8 times in the time it takes to turn on a light switch. A bolt of lightning can measure up to three million (3,000,000) volts and it lasts less than one second! Thomas Edison didn't invent the first light bulb but he did invent one that stayed lit for more than a few seconds. Thomas Edison invented more than 2,000 new products, including almost everything needed for us to use electricity in our homes: switches, fuses, sockets and meters. Ben Franklin didn't discover electricity but he did prove that lightning is a form of electrical energy. According to the U.S. Energy Information Administration, electricity consumption will increase by 51 percent from 2002 to 2025. The first power plant owned by Thomas Edison opened in New York City in 1882. The first central power plant ? Pearl Street Station in lower Manhattan, built by Thomas Edison began generating electricity on September 4, 1882. Pearl Street had one generator and it produced power for 800 electric light bulbs. Within 14 months, Pearl Street Station had 508 subscribers and 12,732 bulbs. Since the first power plant lit up 800 light bulbs in 1882, the electric utility industry has grown to generate over 2.5 million gigawatt-hours annually, the equivalent of lighting 4.8 billion 60-watt light bulbs for a year. The size of a typical American home has increased from 1100 to 1800 square feet over the past ten years. AMAZING ELECTRONIC FACT: If you scuffed your feet long enough without touching anything, you would build up so many electrons that your finger would explode! But this is nothing to worry about, unless you have carpeting. The electrons travel through your bloodstream and collect in your finger, where they form a spark that leaps to your friend's filling, then travels down to his feet and back into the carpet, thus completing the circuit. In the past decade scientists developed the laser, an electronic appliance that emits a beam of light so powerful that it can vaporize a bulldozer 2,000 yards away, yet so precise that doctors can use it to perform delicate operations on the human eyeball, provided they remember to change the power setting from "VAPORIZE BULLDOZER" to "DELICATE." A must check link for all electrical engg. follow the link to have a glimpse of the Electrical Engg Dept. check this link for details on DC Motors. check this link for details on AC Motors. Check this link for Experiments. It's not the Voltage that kills you .it's the Amps. What is an AMP . ??.. This video covers the basics of diodes, bridge rectifiers, and how to build simple unregulated AC to DC power supplies than can handle a few mA up to several Amps. How to repair a TV. Repairing a Television in your own house. A DC motor is a mechanically commutated electric motor powered from direct current (DC). The stator is stationary in space by definition and therefore the current in the rotor is switched by the commutator to also be stationary in space. This is how the relative angle between the stator and rotor magnetic flux is maintained near 90 degrees, which generates the maximum torque. DC motors have a rotating armature winding (winding in which a voltage is induced) but non-rotating armature magnetic field and a static field winding (winding that produce the main magnetic flux) or permanent magnet. Different connections of the field and armature winding provide different inherent speed/torque regulation characteristics. The speed of a DC motor can be controlled by changing the voltage applied to the armature or by changing the field current. The introduction of variable resistance in the armature circuit or field circuit allowed speed control. Modern DC motors are often controlled by power electronics systems called DC drives. The introduction of DC motors to run machinery eliminated the need for local steam or internal combustion engines, and line shaft drive systems. DC motors can operate directly from rechargeable batteries, providing the motive power for the first electric vehicles. Today DC motors are still found in applications as small as toys and disk drives, or in large sizes to operate steel rolling mills and paper machines. A brushed DC electric motor generating torque from DC power supply by using internal mechanical commutation, space stationary permanent magnets form the stator field. Torque is produced by the principle of Lorentz force, which states that any current-carrying conductor placed within an external magnetic field experiences a force known as Lorentz force. The actual (Lorentz) force ( and also torque since torque is F x l where l is rotor radius) is a function for rotor angle and so the green arrow/vector actually changes length/magnitude with angle known as torque ripple) Since this is a single phase two pole motor the commutator consists of a split ring, so that the current reverses each half turn ( 180 degrees). Typical brushless DC motors use a rotating permanent magnet in the rotor, and stationary electrical current/coil magnets on the motor housing for the rotor, but the symmetrical opposite is also possible. A motor controller converts DC to AC. This design is simpler than that of brushed motors because it eliminates the complication of transferring power from outside the motor to the spinning rotor. Advantages of brushless motors include long life span, little or no maintenance, and high efficiency. Disadvantages include high initial cost, and more complicated motor speed controllers. Some such brushless motors are sometimes referred to as "synchronous motors" although they have no external power supply to be synchronized with, as would be the case with normal AC synchronous motors. A series DC motor connects the armature and field windings in series with a common D.C. power source. The motor speed varies as a non-linear function of load torque and armature current; current is common to both the stator and rotor yielding I^2 (current) squared behavior. A series motor has very high starting torque and is commonly used for starting high inertia loads, such as trains, elevators or hoists.This speed/torque characteristic is useful in applications such as dragline excavators, where the digging tool moves rapidly when unloaded but slowly when carrying a heavy load. With no mechanical load on the series motor, the current is low, the counter-EMF produced by the field winding is weak, and so the armature must turn faster to produce sufficient counter-EMF to balance the supply voltage. The motor can be damaged by over speed. This is called a runaway condition. Series motors called "universal motors" can be used on alternating current. Since the armature voltage and the field direction reverse at (substantially) the same time, torque continues to be produced in the same direction. Since the speed is not related to the line frequency, universal motors can develop higher-than-synchronous speeds, making them lighter than induction motors of the same rated mechanical output. This is a valuable characteristic for hand-held power tools. Universal motors for commercial power frequency are usually small, not more than about 1 kW output. However, much larger universal motors were used for electric locomotives, fed by special low-frequency traction power networks to avoid problems with commutation under heavy and varying loads. A shunt DC motor connects the armature and field windings in parallel or shunt with a common D.C. power source. This type of motor has good speed regulation even as the load varies, but does not have the starting torque of a series DC motor. It is typically used for industrial, adjustable speed applications, such as machine tools, winding/unwinding machines and tensioners. A compound DC motor connects the armature and fields windings in a shunt and a series combination to give it characteristics of both a shunt and a series DC motor. This motor is used when both a high starting torque and good speed regulation is needed. The motor can be connected in two arrangements: cumulatively or differentially. Cumulative compound motors connect the series field to aid the shunt field, which provides higher starting torque but less speed regulation. Differential compound DC motors have good speed regulation and are typically operated at constant speed. In science, a machine is any device that changes a force into a bigger or smaller force, or alters the direction in which a force acts. Machines come in all shapes and sizes. Large machines such as cranes, bulldozers, and tipper trucks are based on smaller, simpler machines called LEVERS , WHEELS , PULLEYS , SCREWS, and GEARS. Simple tools such as a spade, a knife, a drawing-pin, and a nutcracker are also machines. Most levers are force multipliers. They reduce the effort needed to work against a force called the load. They magnify a small force into a larger force. When a force acts on an object that is fixed at one point, the object turns around this pivot point. The further away the force is from the pivot point, the easier it is to turn the object. That is how levers make work easier. Levers can work in three ways. 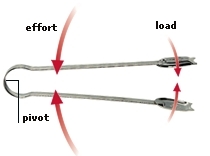 Class one and class two levers turn the effort into a larger force to work against the load. Class three levers work in the opposite way, to reduce the force and increase the control of it over a greater distance. 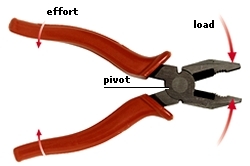 Pliers reduce the effort needed to grip something tight. The load and the effort are on opposite sides of the pivot. The load is greater than the effort. A nutcracker reduces the effort needed to crack a nut. The effort is applied further away from the pivot than the load. The load is greater than the effort. Sugar tongs and tweezers reduce the force you apply and increase your control of it. 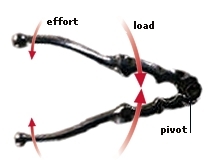 The effort is applied closer to the pivot than the load, and is greater than the load. A wheel and the axle it turns around combine as a machine that works like a lever. The distance between the rim of the wheel and the axle multiplies either speed and distance or force. If the effort is applied to the axle, the rim of the wheel turns further, and so faster, than the axle, but with less force. If the effort is applied to the rim of the wheel, the axle turns with more force but not so far or fast. A steering wheel multiplies force because the rim turns further than the steering column. It multiplies your effort and turns the car’s wheels with more force than you actually apply. The road wheels multiply speed. The car’s engine turns the driveshaft and rear axle at a certain speed. The axle turns the large road wheels further and therefore faster. Working of Single phase induction motors is explained in this video with help of animation. When only single power phase is available, single phase motors are natural choice out of wide variety of electric motors. In this video concept of double revolving field theory, main winding, auxiliary winding, and the way motor is made self start is explained in detailed way. Asynchronous Induction Motor : How does it work.?? There are times when it may seem like we're living in the future. We have devices that we can hold in our hands and use to call up information stored in computers in enormous data centers all over the world. We can watch a film on one device, switch to another gadget and pick up right where we left off. We can automate our homes to perform tasks even if we're on the other side of the world. But then there is always a wake-up call. Where are our jetpacks? Where are our flying cars? And what the heck are we supposed to do with all these darn cables? That last question becomes increasingly relevant as we acquire more mobile devices. Smartphones, e-readers, tabletsand portable music players are just the beginning. And each of these devices requires power to operate, which means sooner or later you'll have to charge them. That's when those cables really become an irritation. You may have to deal with proprietary cables for multiple devices, meaning each cable will fit one -- and only one -- of your gadgets. If you aren't lucky in cable roulette, you have to keep grabbing cables until you find the right one. And if you have to recharge everything at once you've got a techno-octopus just waiting to tangle you up. But there are ways to transmit power -- and charge devices -- without cables. There are several products on the market today that you can use to recharge a device just by setting the gadget down on a charging pad. Then, as if by magic, power transmits from the pad to the device. But it's not magic -- it's science!